Reading progress update: I've read 201 out of 636 pages. "Merchants could be found crossing the South China Sea in ever greater numbers, establishing trading posts in Sumatra, on the Malay peninsula and above all on the Malabar coast of southern India, home to the world's great supply of pepper - long established as a favoured commodity in China as well as in Europe and elsewhere in Asia. By the middle of the fourteenth century, so many ships were sailing to towns like Calicut that some observers commented that all maritime transport and travel in this part of the Indian subcontinent was being undertaken in Chinese boats. An example of their typical flat-bottomed design has been recently identified wrecked off the coast of Kerala. The lubricant in this long-distance trade was silver, which took on the form of a single currency across Eurasia. One reason for this was the innovation of financial credit in China that had been introduced before Genghis Khan's time, including the introduction of bills of exchange and the use of paper money. Adopted and improved by the Mongols, the effect was the liberation of enormous amounts of silver into the monetary system as new forms of credit caught on. The availability of the precious metal suddenly soared - causing a major correction in its value against gold. In parts of Europe, the value of silver plunged, losing more than half its value between 1250 and 1338. In London alone, the surge in silver supply allowed the royal mint to more than quadruple output between 1278 and 1279 alone. Production rose sharply in Asia too. In the steppes, too, coin production took off as rulers of the Golden Horde began to strike coins in large quantities. New regions were stimulated too. Japan, which had relied heavily on barter or on payments in products such as rice as an exchange mechanism, shifted to a monetary economy and became increasingly active in long-distance trade." And this is all that Frankopan has to say about the revolutionary introduction of a monetary system. Seriously, those three paragraphs are all there is. He spends the next five or so pages on the effects of the Black Death on Europe. 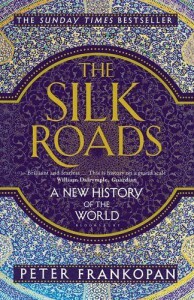 While I agree that this was a huge event changing everything, the effects of the plague in Europe are not what I look for in a book supposedly about the Silk Roads. But who am I kidding...this book is all over the place. Btw, guess what the next chapter is about? Yup, Columbus and the exploration of the Americas. This is where I am going to abandon ship. I'll skim/skip-read to end but that is it.